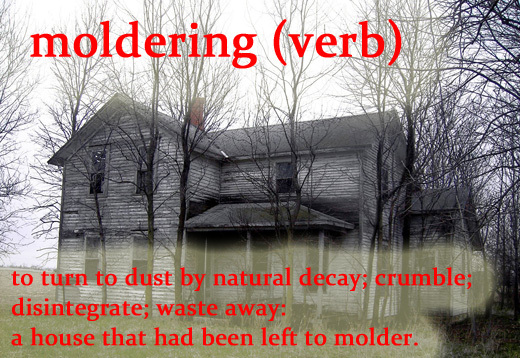 In America, many houses are left to molder. Inner city mansions, farm houses, and prairie churches alike meet this sad fate. I find this waste of buildings reprehensible. (Did you know half of all waste in landfills is building materials?) The waste is unwarranted, but what’s more, it’s as if we care so little about our history, that we happily erase where it has taken place. I’m given to exploring abandoned buildings. I’m always thrilled when I find something like a weather-worn piano. I stop to imagine the family that once sung around the piano on holidays—and then I wonder where they went and why they left the locus of their memories to rot. Do you see an importance in saving structures from a time gone by? Side thought: Do you think Moulder (from X Files) was named with this word in mind?